M&H Soaring is an FAA certified repair station with 20 years experience in glider repairs, refinishing and maintenance. 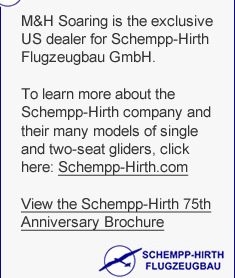 We are the exclusive US representative for Schempp-Hirth Flugzeugbau GmbH since 2004. 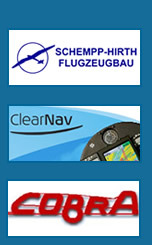 M&H Soaring is also a dealer for Cobra Trailers and ClearNav glider instruments. Call or email for information on glider and trailer purchase, repairs, winglets, glider or trailer parts and glider instruments. Please visit the Schempp-Hirth web page to review German AD’s issued on the Airbrake system of Duo Discus, Nimbus 4D, and Arcus. Parts will be available through M&H Soaring shortly.